by Cohen, Arthur M.; Brawer, Florence B.; Kisker, Carrie B. For over thirty years The American Community College has provided up-to-date information and statistics about community colleges and has been widely used in graduate courses and by community college scholars, institutional researchers, on-the-ground administrators. The sixth edition includes an entirely new chapter focused on community college outcomes and accountability, as well as new sections dealing with the rise of for-profit colleges; vertical expansion, including dual enrollment and community college baccalaureates; cross-sector collaboration; student characteristics and enrollment patterns; the implications of part-time faculty; leadership and administrative challenges; revenue generation and state allocation patterns, including performance-based funding; distance learning; statewide efforts to improve transfer and articulation; and, finally, a response to contemporary criticisms of the institution. All chapters and data have been updated, and each chapter includes guiding questions for reflection and discussion. Arthur M. Cohen is professor emeritus of higher education atUCLA, editor-in-chief of New Directions for Community Colleges, and the author of numerous books and articles on community colleges. Florence B. Brawer is former research director of the Center for the Study of Community Colleges and associate editor of New Directions for Community Colleges. 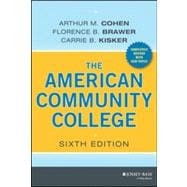 Cohen and Brawer together wrote several books on community colleges, including five previous editions of The American Community College. Carrie B. Kisker is an education research and policy consultant and a director of the Center for the Study of Community Colleges. She is the former managing editor of New Directions for Community Colleges. Cohen and Kisker are the coauthors of The Shaping of American Higher Education, Second Edition.